Union perfumes are supposedly composed of ingredients sourced from one end of England to the other; the fragrances do, for the most part, have a “natural” vibe, but Union perfumer Anastasia Brozler must have re-created some of the British plant scents (and “scene scents” — the ocean, wetlands, tea-time) using aroma chemicals or ingenious combinations of perfume notes — natural and “artificial” (among the stranger ingredients mentioned: mountain ash, bracken and Marmite). Until recently, Union’s five perfume offerings were only on sale at Selfridges in the UK. When the perfumes were released in the summer of 2012, I was expecting a LONG wait to try them...and it was. But I must give shout-outs to two people for helping me sample the entire line this fall (including the newest offering: Gunpowder Rose): Kamini at Selfridges in London and my friend Rekha who brought the perfumes back to Seattle with her after vacationing in England. Though I like almost all of the Union fragrances, and will review a few more come January or February, Celtic Fire stood out as ballsy, interesting and unusual. The fens of County Derry provide the rich and smoky peat that is the inspiration for this scent, which speaks eloquently of primordial, untamed terrain with oak extract, fir balsam and pine needles from the wilds of Aberdeenshire. Glowing birch tar from Inverness-shire and the gentle sunshine-sweetness of bog myrtle from Fife complete this ode to wode! Positively tribal. Added to these “wild” notes are more cozy aromas “of British hearth and home: log fires, leather, tea and toast!” And Marmite! Celtic Fire starts with the “hot” scent of thick-rich-spicy BBQ sauce…with added smears of sooty birch, “oily” smoke and charred evergreen wood (perhaps fueling the barbecue pit?) As Celtic Fire dries on skin, I detect a smell that reminds me of a still-warm hearth, full of the ashes of once-sap-rich logs. If you love smoke and dense, “primitive” incense aromas — coal-black perfume notes — do try to find a sample of Celtic Fire to sniff. Celtic Fire calms down sloooooowly (and it only calms SLIGHTLY), and as it does, other food-y aromas emerge: lapsang souchong tea, and a salty-yeasty-malty scent — Marmite? I've only eaten Marmite once in my life, and I don’t trust my memory as to how it smelled. I didn't taste it twice — that I remember. If anyone knows, and loves, their Marmite and has smelled Celtic Fire…do comment. Celtic Fire has good lasting power and sillage; one generous “dosage” lasted all day on me. Wearing it in the office or on an airplane might lead co-workers and fellow travelers to believe you spent the night cooking over a food grill or warming yourself next to a roaring campfire. I really wish Celtic Fire had an amber or vanillic base — personally, I'd like a change of tone, somewhere in its development, from Celtic Fire's non-stop, tough, smoky stance. I layered Celtic Fire with Atelier Cologne Vanille Insensée with great results, and will test it with some amber perfumes, too. Union Celtic Fire is available in 100 ml Eau de Toilette, $185. A rollerball coffret of Celtic Fire plus Holy Thistle; Quince, Mint & Moss and Gothic Bluebell (four 5 ml bottles) is $75. For buying information, see the listing for Union under Perfume Houses. Oddly, your description reminds me of Lush Voice of Reason (it’s the BBQ sauce, I think), except that one definitely does have a vanilla-ish base. I have a tiny bottle of it and enjoy it in the right mood, but this one sounds like it might have more soot and tar than I can handle. It’s great to hear that Union is doing interesting and original scents, though. I look forward to the reviews of the others! J: and I like the bottles too! The Lush was the first thing I thought of too. I want to try this. R, I like this better than the Lush. In the scent neighborhood of Lonestar Memories, maybe? (If not the actual neighborhood. )Perfumers do love their smoke, don’t they? Donnie…oh, no. Lonestar Memories is a softie compared to this. R, that one I have never tried. I haven’t tried Marmite, but I have tried its Australian sibling, Vegemite. I didn’t particularly enjoy eating it, but I could see how it might lend a salty, umami effect to a fragrance. I remember thinking it smelled like really concentrated salty beer. The sooty effects in the description make me think of Olympic Orchids Salamanca, which has a definite ashy/sooty note to it. I’d been meaning to try layering Salamanca. I need to find my sample and see if it layers well with Vanille Insensee. Sweetgrass…I like vanilla and smoke…benzoin! This does sound interesting, but I have a question (for anyone who cares to reply). I have to buy whatever I can unsniffed, and my goal is to share as many scents as I can with my patients and clients in hospice/eldercare as a therapeutic tool. I’m just starting, and my goodness what a journey I’m on! I’ve noticed people referring to scents as “interesting” while also mentioning that a particular note is not usually one that they would enjoy. As in Marmite. So the question is … what causes you to take a leap into exploring a perfume when you know that it contains a note, an element, what-have-you, that you have ascertained is one you don’t usually like? I love sweetgrass’s reference to umami, and perhaps that’s it. Composing a perfume is an art we all are in awe of. Celtic Fire sounds like something my dad (a 92-year old Anglophile) would love, but maybe not the Marmite aspect. Then again, it does seem to round out the whole experience. To my mind, though, I’m thinking of an American kid’s lunch layered with your SODT. And for all I know, it’s out there …..
Holly…why must you buy unsniffed? There are so many places to buy samples…of almost anything. I “hate” many individual notes that work just fine in a complex composition…I never nix any perfume from my to-sniff list based on a single ingredient it contains. There are even perfumes out there with ozone, one of my least favorite ingredients, that I enjoy. Same with white musk. Thanks so much, Kevin. I appreciate your response, and I certainly respect your expertise. I have always loved your reviews. I don’t have to buy anything unsniffed, you’re right about that. If you have any suggestions about buying samples, I’d appreciate it. The reality is that my clients can’t leave home, or where they abide and so I’m trying to do this for them. Holly: lots of retail sites like Luckyscent and Aedes de Venustas sell samples…eBay sells lots of samples…Perfumed Court is a “sample store” for the most part. And Nordstrom makes you samples of anything your heart desires. I suspect the answer to your question lies somewhere between whim and caprice! But that is very interesting that you share scents with your clients. How is that going? Do you share fragrances with men as well as women? What do they get out of it? Do you do it in a group so that there is a conversation about the perfume, or one on one? What are their impressions? What sorts of conversations are sparked? Sorry to be so nosey (errr…that pun was not intended!). Thanks, Kevin. I’ve gotten a lot of good suggestions. Thanks, Oakland Fresca. I appreciate your interest! I’ve worked with patients facing serious illness and terminal illness for 20 years. Infants, children and adults. Many of them can’t tolerate perfume as they are on medication regimens (usually chemo) that makes them profoundly nauseous. However, many can tolerate essential oils used cautiously, so I can wear a blend that will help with nausea, fatigue, depression and the like. Angela’s post about World Aids Day prompted me to think about how I could use my love of “traditional” perfume to better the world, and I realized that I would like to share this aspect of my life with my clients who are in hospice or who are elderly and either aging-in-place or in a facility. I haven’t yet put this into practice, so I’m not sure yet what will be the best way to proceed. I anticipate that a one-on-one approach may be the best, but that will also depend on whether or not the client is at home or in an actual hospice or elder facility and regulations imposed. I must admit, I’ve had some eye-opening (not to mention wallet-opening!) moments when considering purchasing vintage or discontinued perfumes from the past, even in sample form. Luckily, I’m old enough to realize that if I do my best, that’s enough. I’ve gotten a lot of great suggestions from the NST gang for which I’m grateful. I might be crazy, but I think I really want to try this. I really like balsams and birch. The notes sound very interesting… no white musk, cashmeran, etc. I dooo love BBQ sauce..never sniffed it in a fume though. I use BBQ sauce as salad dressing, put them on baked potatoes and of course, chicken. I like Stubb’s BBQ sauce atm:). Omega…I love it too…on onions grilled in butter. Bring on the BBQ! Ha! Olenska…I didn’t get any vetiver…though I know what you mean about the “character” of raw vetiver and the notes in Celtic Fire. HI Kevin, did you apply Union Celtic Fire and Vanille Insensee at the same time, or introduce VI later, to be the base you wanted for the other? Lonestar Memories is a softie compared to this? Whoa! How about CdG Black (I think it is)? I tried that only recently. Lots and lots of charred stuff – meat and wood. Interesting smell but not for a personal scent, at least for me. This sounds similar. I like Marmite alot and love the Marmite truffles the chocolatier Paul Young produces but it is a love it or hate it taste. Donanicola…yes, Lonestar is a comfort scent in comparison…I think this is tougher than Black too. Those Marmite truffles sound interesting! 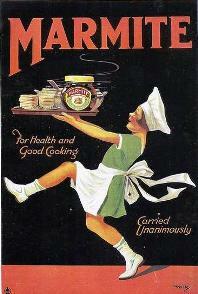 I need to try Marmite again…it has been a long time.